Personal data collection, machine learning and artificial intelligence are encroaching in our lives at a pace that many of us find unsettling, if not downright scary. Not to mention that many of us can't tell the difference in what these terms mean. Purdue's Dan Goldwasser is working to develop tools that harness these powerful new technologies so that they can improve the lives of individuals—and maybe improve society, too. Although you may think of artificial intelligence as a technology for that far-off Jetsons future, we interact with it every day, often without noticing, says Goldwasser, an assistant professor of computer science. "It used to be when typing on a computer or a smartphone, it would point out misspelled words, which is pretty simple for conventional computing to do," he says. "Now, if you type 'whether' when what you meant was 'weather,' the app will let you know, 'yes, that is a word, but it's not the word you intended.' This takes an understanding of the syntax of the sentence and the context, and this is done through artificial intelligence." 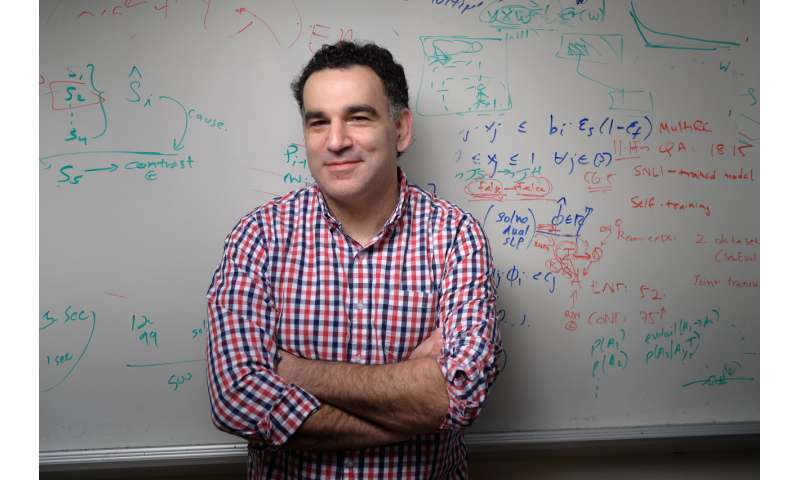 Goldwasser's research is in artificial intelligence, focusing on machine learning and natural language processing. He says people often confuse the three technologies or simply don't know what any of these terms mean. "Artificial intelligence, which is getting a lot of buzz and attention these days, is the set of methods, systems or approaches for computers that try to mimic human judgments and human decision making," he says. "Machine learning is a set of methods that use data in order to accomplish a task." If your task can be narrowed down into a straightforward mapping from input to output, then machine learning can help you with that. But, if you want the system to go beyond that and figure out the odds, for example, based on the mood of the players by scanning social media, it will need to weigh in many other variables and reason about their relationship to Saturday's game. For example, a post indicating that one of the players will attend their sister's wedding on Saturday would require the system to make an inference that the player would not be able to attend the game, changing the odds of winning. That's a process that requires artificial intelligence, Goldwasser says. One common place where people encounter basic AI and machine learning is with personal assistant devices, such as Amazon's Alexa, Google's Google Home, Apple's Siri, and Microsoft's Cortana, which all use the third technology Goldwasser researches—natural language processing—which he explains is the area of artificial intelligence that specifically focuses on replicating human judgments about to human language. Consider, for example, what would seem to be a simple question you might ask a co-worker: "Hey, did the Giants win last night?" For a computer, the question is enormously complex. "We make many inferences when we converse with someone, and these shortcuts that come very naturally for us without thinking, but when you have to make them explicit, you understand there is complex reasoning behind them," Goldwasser says. "So, did the Giants win? Think about the space of possible worlds the system has to explore. There are the football New York Giants and the San Francisco baseball Giants. The system has to know this and reason about whether it is baseball season or football season, and did they have a game in the last 24 hours. But you can also imagine there is some military group that people refer to as the Giants, and did they just fight some battle? You can ground the meaning of that word in many different ways." Even if you remove the ambiguity of the question and know that you are asking about a baseball team, the system still faces a complex problem, Goldwasser says. The system has to know what it means "to win," and what information is relevant to the user. There may be a baseball team in South America called the Giants, but the system has to know whether you care about that result. "This sort of reflection and understanding of the user is really something that's difficult to program these systems to do, and it's not something that the system can accomplish by just pulling from data, without additional reasoning," Goldwasser says. His AI research aligns with Purdue's Giant Leaps celebration, acknowledging the university's global advancements made toward an advanced economy and planet as part of Purdue's 150th anniversary. This is one of the four themes of the yearlong celebration's Ideas Festival, designed to showcase Purdue as an intellectual center solving real-world issues. For Goldwasser's own projects, he's developing tools that use artificial intelligence to analyze the universe of data to provide insights about current issues. For example, one project analyzes social media posts and public comments of elected officials to predict when they will vote against their own political party. "We have used this with state legislators to predict how they will vote on health care," Goldwasser says. "The legislators may never reveal their stance on Twitter, but we can predict by the way they frame the issue how they will vote when the time comes." Another project, funded by Google, is creating a tool to look at a news source and use a variety of data points, such as how often various political viewpoints are used by the outlet and the social connections of people interacting with the outlet, to determine how biased the outlet is. A third project that's an outgrowth of his research is a tool to analyze social media comments of a local population to look at how they are framing an issue in order to predict what the response to an action might be. "For example, if you are thinking about sending troops into a country to assist with a refugee crisis, would that be viewed by the locals as needed assistance or an aggressive act? We hope to be able to give decision makers tools to understand this as they make policies to avoid dangerous mistakes." This research has analyzed social media posts and public comments of elected officials to predict when they will vote against their own political party. "Building on that, we started a collaboration with a political science professor, Eric Waltenburg, to analyze local government data," Goldwasser says. "For this project, we were recently awarded funding as part of Purdue's Integrative Data Science Initative."